The Irish Women’s Abortion Support Group (IWASG) was established in the early 80s to assist women coming to the UK from the Republic of Ireland and Northern Ireland seeking abortions. Much of the group’s work, which lasted around 20 years, was conducted undercover. 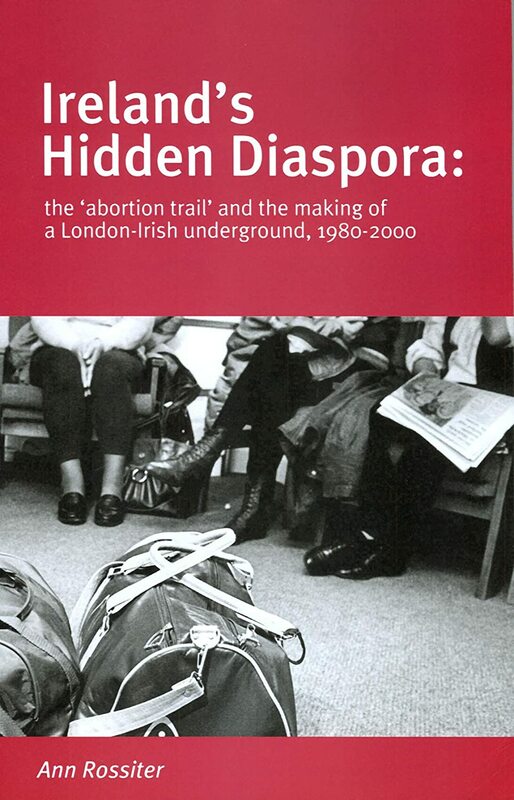 Author and feminist, Ann Rossiter is one of the founding members of the IWASG and she documents the its history in her book Ireland’s Hidden Diaspora: The ‘Abortion Trail’ and the Making of a London-Irish Underground, 1980-2000. Ann Rossiter’s book ‘Ireland’s Hidden Diaspora’ documents the IWASG’s history. The charity Abortion Support Network continues with the work initiated by the IWASG, helping around 400o women from Ireland (90o of which are resident in Northern Ireland) a year to have abortions in England and Wales. 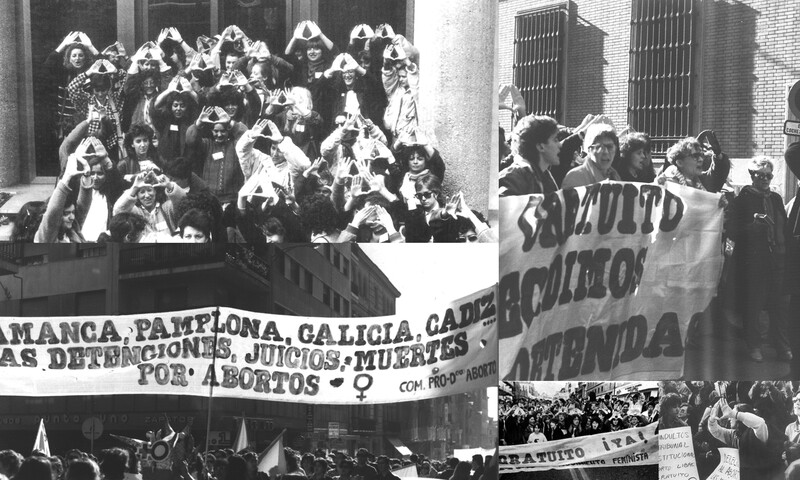 About the same time as IWASG was formed, a sister organisation, the Spanish Women’s Abortion Support Group (SWASG), was set up. Both IWASG and SWASG emerged out of debates, often taking place collectively, where Irish and Spanish feminists in London decided to do something practical about the plight of abortion seekers from their respective countries. In the Spanish case, it was a response to the arrival of several hundred Spanish ‘tourists’ at London airports every week. […] in 1985 there were 17,688 abortions performed on Spanish women in Britain […]. Many of the women [abortion seekers] didn’t know any English and required help with more or less everything. […] The Spanish women would be very upset over the great secrecy, all the scheming they had to do. They were in a terrible state. When the abortion was over, it was like a great wight was lifted off them. If a woman was ringing us out of the blue without having consulted a doctor or counsellor in either Ireland or Spain, we would provide a full service for her, including arranging accommodation, whether in a B&B or with an IWASG or SWASG member. […] We would then book an appointment for a consultation and counselling at the clinic. Isabel adds that due to the covertness of abortion support work, the IWASG was referred to by the codename Imelda. Indeed, the Irish government had implemented a ban on information in 1987. By using the codename, women could seek help and information about abortion without fear of being prosecuted. Why is all this relevant to My Belly is Mine as a campaign? Firstly, Ann Rossiter is still campaigning for abortion rights in Ireland today. Furthermore, Ann is now part of Speaking of I.M.E.L.D.A., a direct action feminist performance group that seeks to challenge the ongoing problem of Ireland Making England the Legal Destination for Abortion. The “Imeldas” often collaborate with My Belly is Mine, thus thirty odd years after the foundation of the IWASG and SWASG, Spanish and Irish women continue to work together on prochoice campaigns. 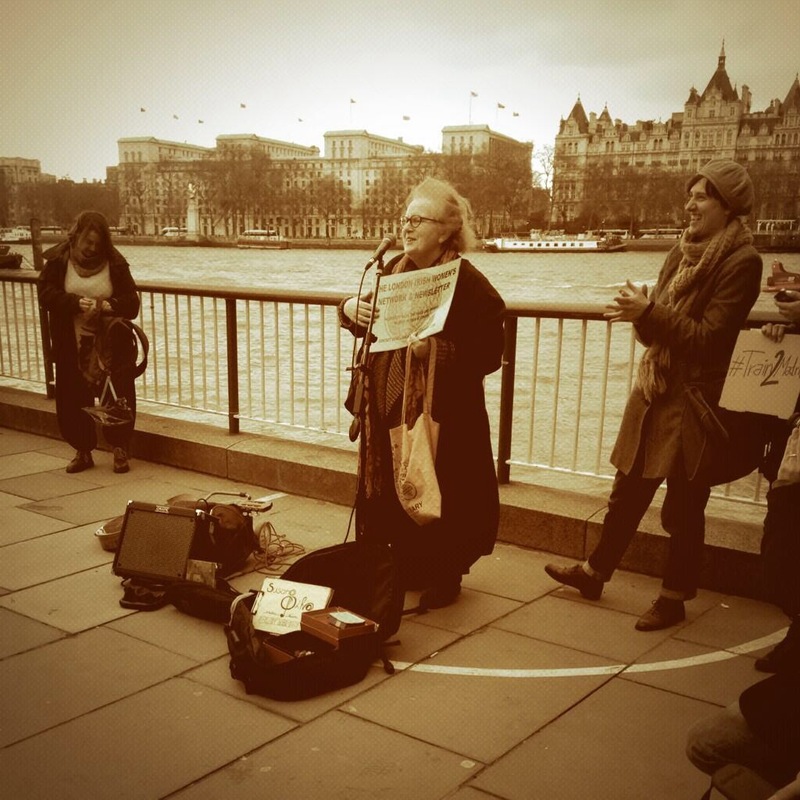 Ann Rossiter, one of the founders of IWASG, at a My Belly is Mine protest on 1 Feb, 2014. Isabel Ros López is also still an activist. Naturally, Isabel is deeply concerned by the Spanish government’s recent proposal to ban abortion. 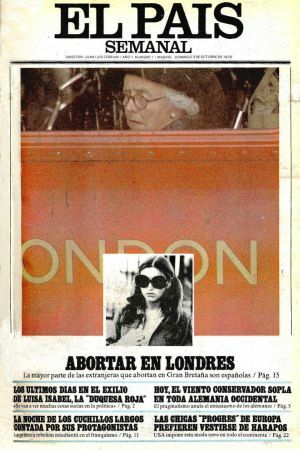 Having closely witnessed the times during which abortion was illegal in Spain, Isabel has been able to provide guidance to the members of the Spanish Women’s Assembly on how to provide support and assistance to Spanish women seeking abortion in London, should the antiabortion bill be passed as law. Isabel has also been a speaker at a number of My Belly is Mine protests too. 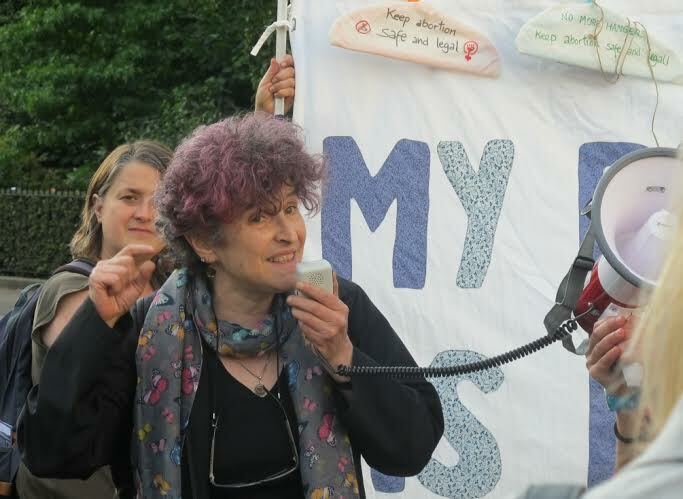 Isabel Ros López at the joint protest organised by My Belly is Mine and the Spanish Women’s Assembly at the Spanish Embassy, London on 27 June 2014. It is under worrying circumstances that young Irish and Spanish women in London today have found they have a shared history. If you are interested in finding out more about the history of the IWASG and the SWASG, Ann’s book is the best source of information. We will be writing more about the SWASG, its work and its relationship with the IWASG in upcoming blog posts. In the meantime, click here for an interview with Ann Rossiter. In May 2014, Feminismos 15M Berlin, a Spanish feminist collective based in Berlin, and part of the 15M Movement of young Spanish exiles abroad, contacted all of its counterparts throughout Europe. They expressed the importance and aim of setting up a European support network for women in Spain, who may be forced to travel abroad for abortion, once the antiabortion law in Spain has been passed. Feminismos 15M Berlin have named the network after Federica Montseny (1905-94), a Spanish intellectual and anarchist and one of the first women in Europe to become a cabinet minister when she was appointed as Health Minister in 1936. Montseny was also renowned for her prochoice legislations. Feminismos 15M Berlin pointed out that London is a key city in this network: an obvious destination, not only due to its proximity, the amount of low cost flights from Spain to the British capital, or the fact that English is a language most Spaniards have some familiarity with but also: London was a notorious destination for Spanish women in the 70s and 80s seeking terminations. The Spanish Women’s Assembly in London has taken on the responsibility of creating the corresponding support network in the British capital for women in Spain who are forced to travel for an abortion. It is an important responsibility and one that they are taking very seriously. They have already met with a representative of Abortion Support Network to learn more about their working model and how this charity supports the almost 5000 women a year who travel to the UK from Ireland for terminations. The Spanish Women’s Assembly are in the phase of early planning and fundraising for the network. And we will be documenting the history of the network on this blog. Unlike the fake travel agency offering “abortion packages” to London, the Federica Montseny Network is not a hoax. It exemplifies the sad reality that Spanish women will face if Gallardón’s antiabortion law is passed in Spain.